@Inevitable610, @euggie and @DIABLOFARMER are this weeks winners. Next weeks prize is 2 Leoric's Signets, good luck everyone! In all honesty the title is a bit of a lie, not unlike the cake a certain Genetic Lifeform and Disk Operating System promised me. (GLaDOS) But back on topic, today is practically everyones least favorite day and I hope to make it slightly better by doing small giveaways each monday. I love Mondays - Giveaways and plans for the week. Challenge Tuesday - I will go over this more tomorrow, but it is a weekly challenge where users can take part in and share videos of them attempting the challenge if they wish. Something to do other than endlessly killing demons... unless the challenge involves killing demons. Wednesday Market Watch - Discussion of how the market has been doing the past week, following the prices of certain set items and general discussion about all things to do with the auction house. Thursday Build Discussion - Discussing a chosen build and experimenting with new build ideas. Friday Week in Review - A summary and discussion of any news or events that happened during the week. Saturday Morning Articles - A new article each week either by me or highlighted from the community. Sunday Scripture! I mean lore! - Honestly the Diablo story may not be the greatest thing ever but I really do enjoy reading it and discussing the world. Therefor every sunday I will discuss some nerdy part of the Diablo universe. About that 15 million gold... every week is a different prize. They will never be as big as the monthly contests, but they are intended to reward regular visitors of the website. This week we have 3 prizes of 5 million gold each to be given away. Rules: You can only win one prize, so do not answer all 3 questions. The first three people to give correct answers (to my liking) will be the winners. After that I will update the post with the winners names. (1) Who are the three Prime Evils? (2) How long does the unruned Monk skill Serenity last for? (3) What Legendary has a "Chance to summon a Demonic Slave when attacking."? Well that concludes blog entry #12, see you guys tomorrow. There is now an option to view all threads containing unread posts. From the main forums page, look for the link at the top-right that says "Unread Threads". Note: I am aware that this page loads horrendously slow. It will be fixed soon™. Blizzard is considering making a few changes to how Reflect Damage works. One idea is making it a spell that monsters cast periodically along with a duration to how long it lasts. We know Reflects Damage has been a little more challenging for some players in this patch, so we've been reviewing feedback regarding the affix pretty closely since 1.0.5 released. The actual values for the stat haven't changed at all and, in general, it seems like the issue for players is really just related to increased monster health thanks to Monster Power. Since monsters have a lot more health in the higher MP levels, not only do fights last longer, but players need to do a lot more damage in order to kill their targets. Of course, that means there's a lot more opportunity for you to get hit with Reflects Damage. So, whereas before the patch, a player may have been able to kill monsters with the Reflects Damage affix no problem and with health to spare, now that fights are lasting longer that same player may not have as much success -- at least, not without making some adjustments to their build or gear. That said, we do agree that we can make some improvements. For example, we'll be making it so that damage dealt by pets will no longer reflect back to the player. We're also toying with the idea of changing Reflects Damage so that it has a duration and can only be activated by monsters periodically (rather than it always being active), but that's definitely not yet set in stone. Lyrilla also spoke today about additional methods for buying back items that you may have accidently sold. The safeguard is the Buyback tab itself. We wouldn't have added the feature if not for the understanding that mistakes sometimes happen. Even so, there is a certain level of responsibility on the player when it comes to managing your inventory, and it's always a good idea to use caution whenever selling items to a vendor. That said, I'm happy to relay on the feedback regarding a larger Buyback tab. We've actually already discussed the possibility of adding in some sort of "item-lock" system and, while we still feel that players should be mindful of what they're selling or have sold to a vendor before switching games, we haven't ruled out the idea completely. Should the warning dialogue only appear when selling an item that's been equipped? What about the items that players just want to sell and haven't equipped? Or should the warning dialogue appear whenever selling an item of a certain quality level? If so, what quality level is appropriate? Should it apply to only Rares and Legendaries? Or should it apply to all magical items? If the warning dialogue appears when selling all magical items, would that then become tedious for players who farm a lot? If so, which is more valuable to the player: having a warning dialogue in addition to the Buyback option or having a quick way to empty their inventory? n other games that have warning dialogue and a Buyback tab, many players still mistakenly sell their items, so will adding it to Diablo III actually provide a better experience? Molten and Desecrator can be particularly deadly since they have a chance to both stack with themselves and with each other, and it can be easy to miss in the heat of battle. We’re comfortable with the way both affixes are currently working, though, since many gamers are well versed in "don't stand in the fire" scenarios. Just keep an eye out for those ground effects! Update: Maintenance is now over, although things may be buggy for the next few hours. Maintenance has concluded and the auction house is now available. Please note that to help reduce load and improve the overall stability of the auction house system, the game may temporarily limit traffic to the auction house during peak gaming hours. This is done automatically, and players may occasionally see a grayed-out auction house button as a result. If the auction house button is grayed-out, please wait a few minutes and then try again. Lylirra added some extra information on what happens to your auctions that are active during maintenance. If your auction sale is successful, you should receive your money and be able to cash out once all these issues are resolved. Similarly, if your sale isn't successful, then the auction should expire as normal and you can then reclaim the item (and put it back up for sale, if you want). The best thing to do is wait until maintenance has concluded, though. After the auction house is back online, check your auctions. If it looks like there are any remaining issues, you're welcome (and encouraged) to contact Customer Support so that they can investigate and try to assist in any way possible. Active auctions continue to count down even during maintenance. Maintenance is estimated to end at 9:30 p.m PDT. 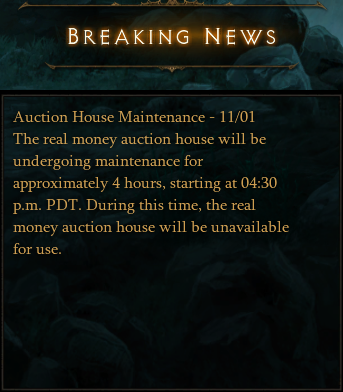 Due to issues affecting auction processing and payment delivery, we have brought the Diablo III auction house offline for urgent maintenance (as indicated in the Breaking News window). We currently anticipate that this maintenance will last for 5 hours, until approximately 9:30 p.m. PDT. Should this schedule change at all before then, we'll be sure to provide an update in this thread. You can also follow @BlizzardCS on Twitter for information and updates regarding any of our online services. We sincerely apologize for the inconvenience and are working to resolve the payment and processing issues as quickly as we can. Last night, our authentication service (the step that verifies your account information whenever you log in) encountered an issue which resulted in some players being unable connect to Battle.net. This issue affected logins for Diablo III, StarCraft II, and World of Warcraft, as well as Battle.net Account Management and our official forums until approximately 11:30 p.m. PDT yesterday evening. We then experienced another issue this morning with our authentication service that impacted most players' ability to log in to our games. That issue was resolved at approximately 10:30 a.m. PDT, and at this time players should be able to connect to Diablo III, Battle.net Account Management, and the forums without any problems. If you are continuing to experience issues with login, please let us know in this thread. Before you do, though, we ask that review our Diablo III Support Page and Technical Support forum first to make the issue isn’t client-side or a known error. Thank you in advance for your reports! Just as a follow up, we're aware that some players are experiencing payment delays from the real money auction house (as well as other general usability issues) and are investigating the issue at this time.